Alison Clode, DVM, DACVO, is an ophthalmologist at Port City Veterinary Referral Hospital in Portsmouth, New Hampshire. Dr. Clode earned her DVM from Washington State University. She has authored multiple journal articles and book chapters on ocular pharmacotherapy and has lectured nationally and internationally on equine and companion animal ophthalmology. Her research and clinical interests include ocular pharmacology, ocular pain management, and equine and small animal corneal diseases. Figure 1 The patient’s left eye on presentation. The generalized corneal edema, superficial and deep peripheral corneal vascularization, and intraocular hemorrhage, with a visible but difficult to visualize pupil, are evident. Sammy, a 9-year-old neutered male Labrador retriever, is presented for evaluation of a red, cloudy, painful left eye. The abnormal appearance to the eye was noted by the owners after Sammy had been left to play unattended with the other dog in the household for approximately 2 hours. No treatment was administered by the owners, and Sammy was presented 45 minutes after the owners first noted the abnormality. On examination, Sammy is bright, alert, and responsive. The left eye is blepharospastic, with mild swelling of the eyelids, conjunctival hyperemia, corneal edema, hyphema, and superficial and deep peripheral corneal vascularization (Figure 1). The pupil is difficult to visualize but appears miotic as compared with the right eye. Direct pupillary light reflex (PLR) is absent, and consensual PLR in the right eye is present but subjectively decreased. Dazzle reflex (ie, reflex reaction to stimulation of the eye by a bright light) is positive, but menace response is negative in the left eye. Menace response, direct PLR, and dazzle reflex are positive in the right eye, but consensual PLR in the left eye is difficult to visualize due to hyphema in the left eye. Schirmer tear test shows >15 mm wetting/min in both eyes, fluorescein stain is negative in both eyes, and intraocular pressure (IOP), estimated by applanation tonometry, is 14 mm Hg in the right eye and 6 mm Hg in the left. The remainder of the ocular examination in the right eye, including fundic examination, is normal. Diagnose the patient with presumptive hemorrhagic anterior uveitis secondary to trauma in the left eye and treat for anterior uveitis. Diagnose the patient with hemorrhagic anterior uveitis of unknown etiology in the left eye and perform additional diagnostics. You elect to diagnose the patient with presumptive hemorrhagic anterior uveitis secondary to trauma in the left eye and treat for anterior uveitis. Because of Sammy’s acute onset of ocular changes, trauma is suspected as the cause of intraocular bleeding. Because trauma is a one-time occurrence, treatment is targeted toward controlling intraocular inflammation associated with bleeding and managing discomfort. Administration of a topical ophthalmic antibiotic–corticosteroid combination (eg, neomycin–polymyxin B–dexamethasone ophthalmic solution [1 drop in the left eye q12h]) is initiated to control intraocular inflammation, and analgesia is provided through oral NSAIDs. Recheck examination is scheduled for 3 to 5 days later. On recheck examination performed 5 days following initial presentation, the owners report that Sammy became significantly more comfortable in the first 1 to 2 days following initial presentation but began squinting and rubbing the left eye a day before the recheck examination. Blepharospasm is present in the eye. The corneal edema has improved, with less free-floating blood and more discrete clotting around the dyscoric pupil (Figure 2). The pupil is miotic and irregularly shaped (ie, dyscoric), with irregular bulging and thickening of the surrounding iris. IOP is 43 mm Hg, and menace response, direct PLR, dazzle reflex, and consensual PLR in the right eye (resulting from shining light in the left eye) are absent. The ocular examination remains normal in the right eye. Figure 2 The patient’s left eye on recheck examination 5 days after initial presentation. The corneal edema has improved, with less free-floating blood and more discrete clotting around the dyscoric pupil. Clinical diagnoses include hyphema with an intraocular blood clot, secondary glaucoma, and blindness in the left eye. Determining the prognosis for regaining vision is difficult; however, the owners’ report of Sammy’s squinting and rubbing the eye for at least a day (potentially indicating glaucoma of a day’s duration), lack of a consensual PLR in the right eye in response to shining light in the left eye, and lack of dazzle reflex in the left eye are suggestive of a poor prognosis for regaining vision.1 More aggressive intervention is advised to improve comfort while minimizing the intensiveness of medical therapy. Options for intervention include evisceration (ie, replacement of the intraocular contents with an implant while preserving the cornea, sclera, extraocular muscles, and adnexa), enucleation (ie, surgical removal of the entire globe), or gentamicin (25-50 mg injected into the vitreous) to destroy the ciliary body, thus decreasing production of aqueous humor and lessening dependence on medications to control secondary glaucoma. Intraocular injections may be contraindicated in eyes with pre-existing ocular hemorrhage due to the potential increase in hemorrhage, and evisceration is primarily performed for cosmetic reasons. Thus, enucleation is elected in this patient and performed under general anesthesia. The globe is submitted for histopathology, and the findings are consistent with intraocular hemorrhage and glaucoma and are identified as secondary to an infiltrative, neoplastic iridal lesion. Although treatment with a topical corticosteroid and an oral NSAID is appropriate to control inflammation and pain in cases of presumed traumatic anterior uveitis, additional diagnostic procedures (see Case Route 2) should be appropriately performed on any eye with hyphema to rule out other possible causes of bleeding. If performing additional diagnostic procedures is not possible, more aggressive treatment, such as a topical corticosteroid with greater intraocular penetration (eg, prednisolone acetate 1%),2 may be more effective in producing a favorable outcome if trauma—or another one-time, controllable condition—is the cause. In addition, because the need for antibiotics is low in patients with intraocular hemorrhage (as represented in the neomycin–polymyxin B–dexamethasone combination), avoiding unnecessary antimicrobial use is recommended. If neomycin–polymyxin B–dexamethasone is the only medication readily available, increasing the frequency of administration (ie, to q6-8h) may be helpful as more aggressive initial treatment. Owner education is also a critical component of the treatment plan, as owners should be aware of the signs (eg, squinting, rubbing, increased cloudiness, increased redness) that would indicate that earlier re-evaluation is necessary. Treatment with a mydriatic cycloplegic (eg, atropine ophthalmic solution 1%) is indicated in patients with anterior uveitis and low IOP, even if the pupil cannot be visualized due to signs caused by the disease process. Because anterior uveitis produces a miotic, “sticky” pupil, the risk for complete posterior synechiae—and thus secondary glaucoma—is decreased by the use of atropine, which produces pupillary dilation, decreases exudation from the iris, and provides analgesia via cycloplegia. When surgical removal of a globe is advised to treat a painful ocular disease (eg, glaucoma) and the underlying cause of the disease (eg, intraocular tumor) has not been identified, histopathology is appropriate, as the patient’s well-being may be positively impacted if a previously occult disease process is identified. 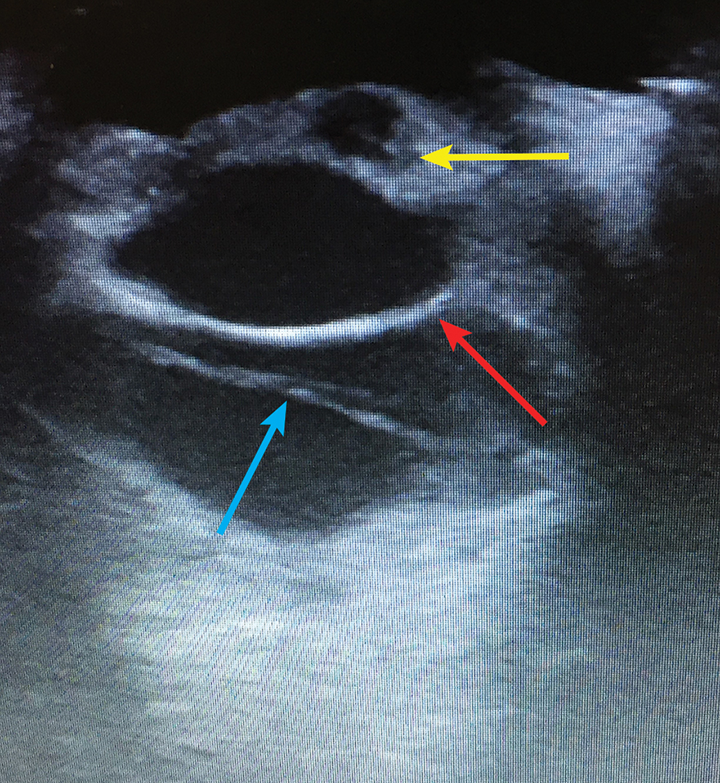 In this case progression, if additional diagnostics—particularly ocular ultrasonography—had been performed at initial presentation, medical management for the intraocular hemorrhage would have been recognized as ineffective treatment for the underlying cause ultimately identified (ie, intraocular tumor). Because ocular ultrasonography may not be performed on all patients with hyphema for various reasons, it is important to consider that more aggressive medical management is appropriate, in the event that anterior uveitis is medically responsive. Based in part on the presence of deep peripheral corneal vascularization, you are suspicious of a more chronic intraocular disease process. You elect to diagnose the patient with hemorrhagic anterior uveitis of unknown etiology in the left eye and perform additional diagnostics. Other conditions that may lead to intraocular hemorrhage, such as those localized to the eye (eg, trauma, retinal detachment, intraocular tumor), as well as those with systemic involvement (eg, systemic hypertension, coagulopathy, vasculitis, systemic infections, systemic neoplasia), are considered.3 Thus, based on the diagnosis of hemorrhagic anterior uveitis and the inability to visualize intraocular structures, additional diagnostics are performed to confirm the underlying cause of the bleeding. These diagnostic tests are ordered to noninvasively and cost-effectively provide the most high-yield information based on signalment and clinical signs. General physical examination parameters are within normal limits. Systemic blood pressure obtained via Doppler averages 110 mm Hg (systolic). CBC, serum chemistry profile, coagulation testing, and urinalysis results are normal. Further tests to evaluate for systemic inflammatory and neoplastic conditions (eg, infectious disease titers, chest and abdominal imaging) are not performed, and further ocular evaluation is pursued. Following administration of a topical local anesthetic (ie, proparacaine ophthalmic solution [2 drops administered 3-5 minutes apart]), ocular ultrasonography is performed with a 12-MHz transducer placed transcorneally in transverse and sagittal orientations using sterile lubricating jelly.4 Although visualization of the anterior segment is less clear with this probe than would be achieved with a higher-frequency probe, multi-focal cavitations within the iris architecture, as well as complete retinal detachment (Figure 3), are identified. Figure 3 Ultrasonographic image of the patient’s left eye obtained on initial presentation. The cornea is near the top of the image, and the sclera is toward the bottom of the image, with the posterior lens capsule (red arrow) visible. Retinal detachment (blue arrow) is visible as a hyperechoic line in the vitreal space, and the cavitary lesions of the iris (yellow arrow) are present anterior to the posterior lens capsule. Based on the signalment, general physical examination findings, and additional diagnostic tests and procedures, diagnoses of hemorrhagic anterior uveitis and retinal detachment secondary to a suspected iridal tumor are made. Because the likelihood of controlling intraocular hemorrhage and regaining vision are poor based on the underlying disease process, surgical removal of the eye and submission for histopathologic evaluation are recommended. Enucleation of the left eye is performed, and the globe is submitted for histopathologic evaluation. A diagnosis of iridal hemangiosarcoma, with retinal detachment and intraocular hemorrhage, is made. Radiography of the chest and abdominal ultrasonography are performed to determine if metastatic disease is present, and the findings are normal. Evaluating the patient for disease processes potentially associated with intraocular hemorrhage was appropriate to determine the prognosis and effective therapies. Ocular ultrasonography was the most informative diagnostic procedure performed and allowed for appropriate intervention to be performed at an early stage in the ocular disease process. Radiographic imaging (eg, chest radiography, abdominal ultrasonography or radiography) may also be considered preoperatively to determine the overall systemic condition prior to surgical intervention. If not performed preoperatively, as in this case, radiographic imaging can be performed postoperatively if histopathology results indicate. Jinks MR, Olea-Popelka F, Freeman KS. 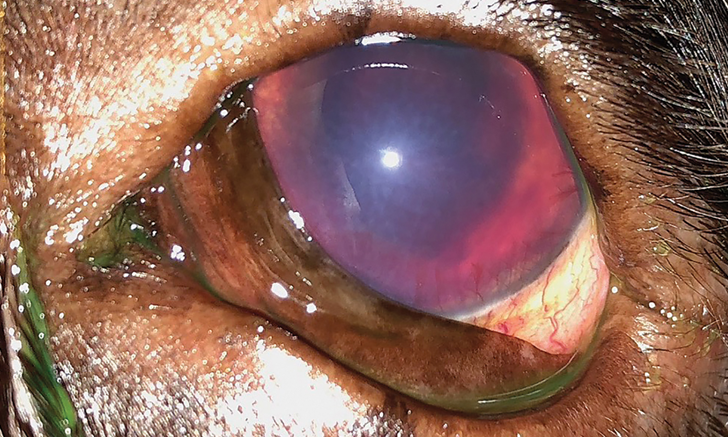 Causes and outcomes of dogs presenting with hyphema to a referral hospital in Colorado: a retrospective analysis of 99 cases. Vet Ophthalmol. 2018;21(2):160-166. Rankin A. Clinical pharmacology and therapeutics. In: Gelatt KN, Gilger BC, Kern TJ, eds. Veterinary Ophthalmology. 5th ed. Ames, IA: Wiley-Blackwell; 2013:407-422. Bergstrom BE, Stiles J, Townsend WM. 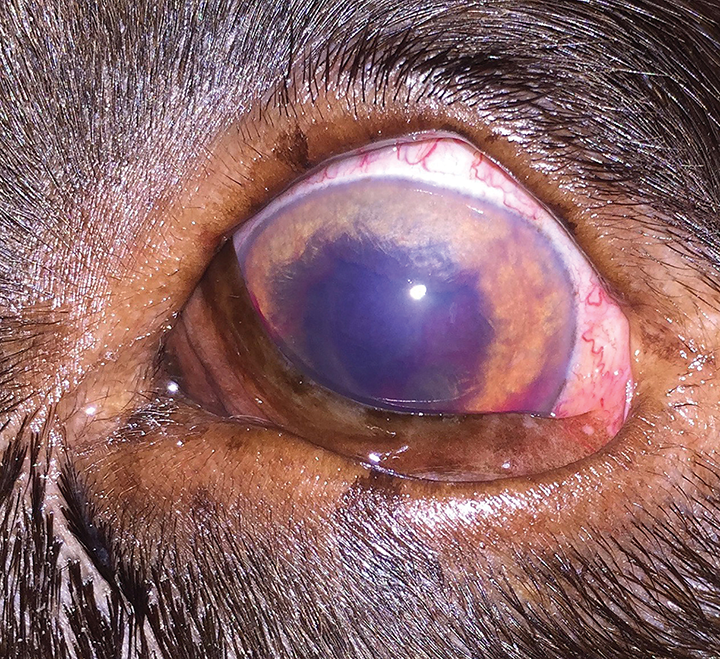 Canine panuveitis: a retrospective evaluation of 55 cases (2000-2015). Vet Ophthalmol. 2017;20(5):390-397. Dietrich UM. Ophthalmic examination and diagnostics. In: Gelatt KN, Gilger BC, Kern TJ, eds. Veterinary Ophthalmology. 5th ed. Ames, IA: Wiley-Blackwell; 2013:669-683.